This finger guards give polishers the protection necessary to do the job right. Featuring an enclosed end and elastic to hold them in place. 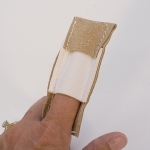 This finger guards are made of pliable leather. Sold per pack of ten, or by the piece.